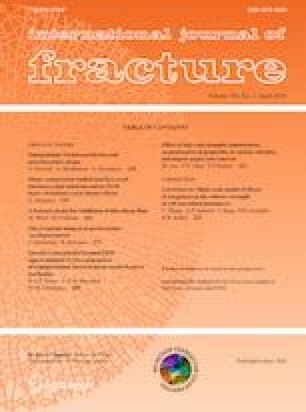 A model based on discrete unit events coupled with a graph search algorithm is developed to predict intergranular fracture. The model is based on two hypotheses: (i) the key unit event associated with intergranular crack propagation is the interaction of a grain boundary crack with a grain boundary segment located at an angle with the initial crack plane; and (ii) for a given crack path, the overall crack growth resistance can be calculated using the crack growth resistance of a collection of unit events. Next, using a directed graph containing the connectivity of grain boundary junctions and the distances between them, and crack deflection versus crack growth resistance data, a directed graph in the J-resistance space is created. This graph contains information on the crack growth resistance for all possible crack paths in a given grain microstructure. Various crack growth resistance curves are then calculated including those corresponding to: (i) a local resistance minimum; (ii) a global minimum; and (iii) for verification, a path specified by microstructure-based finite element calculations. The results show that the proposed method based on discrete unit events and graph search can predict the crack path and the crack growth resistance for cracks that propagate from one grain boundary junction to another. The proposed computationally inexpensive model can be used to design material microstructures with improved intergranular fracture resistance, and/or to assess the overall crack growth resistance of materials with a known distribution of grain morphology. The financial support provided by the Pazy foundation young researchers award Grant # 1176 (SO), U.S. National Science Foundation Grant CMMI - 1663130 (AS), and European Union’s Horizon2020 Programme (Excellent Science, Marie-Sklodowska - Curie Actions, H2020 - MSCA - RISE - 2017) under REA Grant agreement 777896 (Project QUANTIFY, SO and AS) are gratefully acknowledged. We are also grateful for the high performance research computing resources provided by Texas A&M University.